For all Dandiya and Garba enthusiasts, the man with the magical voice Atul Purohit, is on his 12th tour to Australia. He will entertain audiences in Sydney on the 15th and 16th of September along with his famous Rutambara Group. Atul Purohit, the king of timeless DANDIYA – GARBA hits, is a Limca World Record holder and has charmed audiences across the world for over two decades. The Man of timeless Classics is coming back to Australia for the 12th consecutive year in September 2018 to mesmerize everyone down under. Atul Purohit is a living legend when it comes to Gujarati folk music & Garba lovers. Premier Tickets is an online event marketing and ticketing agency. 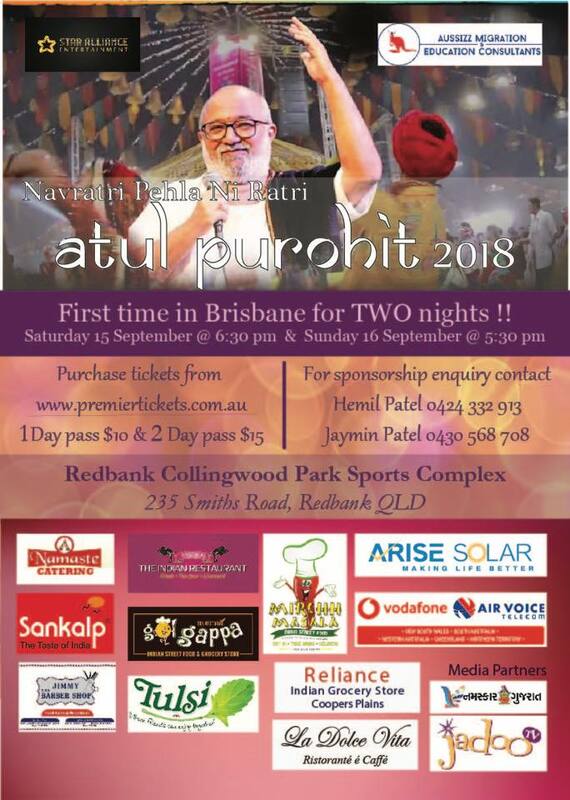 Premier Tickets will NOT be responsible for any changes related to the event schedule, artist, venue or cancellation and refunds related to the tickets for Navratri Mela 2018 in Brisbane Event.